If this card is in your hand: You can Tribute 1 Dragon-Type monster and 1 other Fiend-Type monster from your hand and/or your side of the field; Special Summon this card. Once per turn: You can discar..
Only the master of the sword among Fiend-Type monsters is permitted to hold the Talwar. 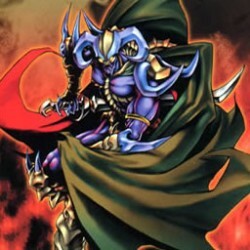 (This card is always treated as an "Archfiend" card.) .. If this card attacks or is attacked, during damage calculation (in either player's turn): You can send 1 card from your hand to the Graveyard once per battle; this card gains 600 ATK during that damag.. When this card is Normal Summoned: You can target 1 other face-up monster on the field; increase that target's Level by 2 until the end of this turn. ..
Activate this card by targeting 1 monster in your Graveyard; Special Summon that target in Attack Position. When this card leaves the field, destroy that target. When that target is destroyed, destroy.. If this card is in your hand: You can Tribute 1 LIGHT monster; send 1 "Odd-Eyes Dragon" from your hand, Deck, or your side of the field to the Graveyard, and if you do, Special Summon this card. When ..